When "Downton Abbey" returns to the U.S. for its fourth season, it actually won't pick up right where it left off. 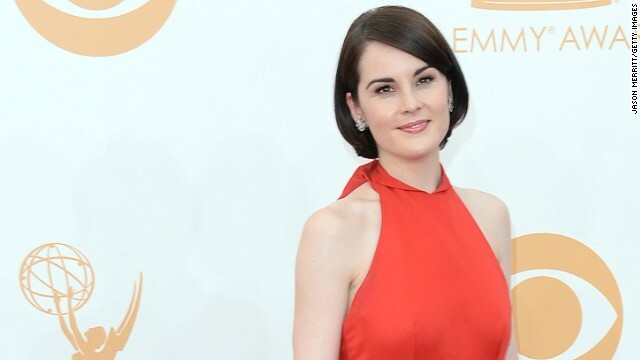 "In the fourth (season), really the central strand is the rebuilding of (Michelle Dockery's) Lady Mary," Fellowes told CNN at the Emmy Awards Sunday. "You will have a chance to witness how she recovers. We begin the show six months after (Dan Stevens') Matthew dies." In the season four premiere, everyone is rallying around Dockery's poor Mary, "trying to bring her out of her grief." Thankfully, "she does slowly come out of it," and this season won't be total mourning. "As much as there’s a dark side with Matthew going, there’s lots of light to it," Dockery continued. "The '20s have really kicked off, so there are a lot of changes, it’s wonderful. It’s about the characters adjusting to that change." There are lots of behind-the-scenes changes on "Downton" this season, too, as the period drama diversifies. In the spring, executive producer Gareth Neame revealed that "Downton" has added its first recurring black character to the story, with Gary Carr tapped to portray charismatic jazz singer Jack Ross. According to Fellowes, Carr will have "a strong narrative" throughout the season. "It just felt right," Fellowes continued. "We wanted to show that the world was changing and broadening and this is a new era - not just the music, but the people playing it was different than before the war." One thing's for certain: American audiences have already marked January 5 on their calendars, so they don't miss a moment of season four's bow. "I love the enthusiasm for the show over here," Fellowes told CNN. "It’s like nothing I’ve ever known. It’s a whirlwind of affection." when is season 4 scheduled to air in the US? I thoroughly enjoyed Downton Abbey, I have all three seasons, but, I wont be watching or buying the fourth season. I was too disappointed when Matthew died. If you "thoroughly enjoyed" the show its dumb to quit watching just because 1 character died unless thats the only character you liked – then i'd say you were lying because you did not really "thoroughly" enjoy it. the actor who played matthew was already slated to leave to do other things. In England it is rare for a show to go over 3 years but with it's popularity in the US, they renewed it. The actors however do many different things. They don't stick with shows longterm like they do here. I read all of this on the artilce given by the actor who played Matthew. You should continue to watch this well-done show. I hate that Matthew is gone to but the storytelling is great. She's already brain-dead....any accident that would befall her would be redundant. Sarah Palin is like a sneeky fart in the room. Noone know who put it there but everyone is disgusted and too nervous to ask whoever is responsable to leave. Better not mention the human fart, the stain on the american flag – Palin. God I hope she dies soon.